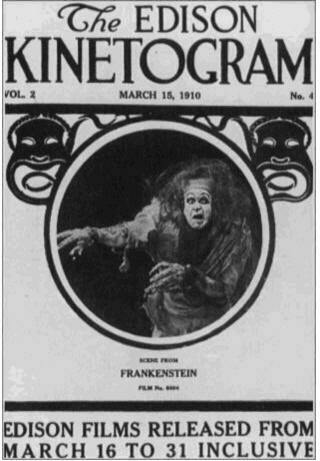 One of the most sought after short films by fans of the silent era is the 1910 production of Frankenstein from Thomas Edison’s Edison Studios. For many years the only image thought to exist from the 15-minute feature was a single photo of wild haired, shambling monster grimacing at the camera. Fortunately, recent years have revealed that it’s not as lost as one would think. Frankenstein was filmed at Edison Motion Picture Studios located on the corner of Decatur Avenue and Oliver Place in the Bronx, New York, one of several dozens pictures the studio produced that year. The studio was built between 1906 and 1907 in response to the growing demand for films. Edison had been the leading pioneer of first kinetoscopes and then projected motion pictures. His first film studio, located near his laboratories in Orange, New Jersey, was too inconvenient to the majority of actors based in New York City. A studio opened on the roof of a building on 25th Street in Manhattan proved too small to keep up with the demand. The Bronx location was designed to be a state of the art facility to handle all of the Edison Company’s production requirements. It’s proximity to the end of the recently constructed Third Avenue El subway system is believed to have been so actors could slip away to make films without attracting the attention of their peers who may have disapproved of participating in the new and vulgar medium. By 1908, the studio was in full operation, putting out several short, one-reel films a week. The motion picture arm of Edison’s business was also quickly becoming its most profitable- pulling in $200,000 plus an additional $130,000 from the sale of projectors. Still, Edison was losing his grip on being the sole technological innovator for the new medium as more studios sprang into existence with legitimate rights to certain patents. As the popularity of motion pictures grew, so did the attention they received from moral crusaders and reform groups, who decried the new medium as being dangerous and encouraging of immorality. Some called for strict laws governing film content and some communities banned theatres all together. Knowing that these groups could pose a serious threat to his bottom line, Edison ordered that not only the production quality of his films be improved, but also their moral tone. The Trust even set up the first Board of Censors, consisting of film executives and religious and education leaders. One of those changes made to the narrative concerns the creation of Frankenstein’s monster. While Shelly’s novel did not go into specifics about the monster’s creation, the creation scene in the film certainly owes more to alchemy than science. The film certainly didn’t stress the danger of unchecked scientific experimentation, not when the boss has transformed the world with his own scientific marvels. Instead, the monster is cast more as a reflection of Frankenstein’s baser instincts and dark reflection of a mind that presumed to meddle in God’s domain. The part of the monster was portrayed by Charles Ogle. He joined the Edison Stock Company Players in 1909 and had essayed parts as far ranging as Scrooge in a 1910 production of A Christmas Carol to George Washington in a series of films on the history of the United States. Since actors at the time were responsible for their own wardrobe and makeup, Ogle was probably the one who developed the monster’s shambling appearance, perhaps inspired by drawings of how actor Thomas Porter Cooke looked for an 1823 English Opera House stage production of the novel called Presumption or the Fate of Frankenstein. Edison Stock Company Player Augustus Phillips was chosen to portray the role of the monster’s creator Frankenstein. Very little is known about this actor beyond the films that he made at Edison and then Columbia Pictures. He continued to make features into the early `20s at Pathe, Metro and Goldwyn studios. Rounding out the cast is Mary Fuller as Frankenstein’s fiancée Elizabeth, though she is never referred to by name in the film. She had joined the Edison Stock Company Players in 1909 and would ultimately appear in a reported over 500 productions, often with Charles Ogle. 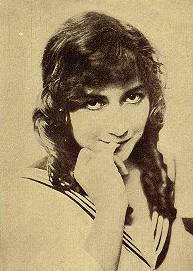 She was also one of the first motion picture stars to receive an on screen credit in 1911 for her lead role in Aida. The film’s director was J. (James) Searle Dawley and had started at Edison as a writer in 1907. He was soon apprenticed to director Edwin S. Porter who had shot the landmark The Great Train Robbery in 1903. A quick study, Dawley was soon directing his own films at Edison within a year. Stylistically, Dawley was the antithesis of Porter though. Porter is generally credited with the development of much of the language of cinema including matched edited shots and the close up. Dawley preferred to shoot each scene as if it were a play, with the camera stoically removed from the action. As director of the film, Dawley was responsible for personally overseeing every aspect of the production from writing the script to approving the set construction and Ogle’s makeup design. In this respect his job was more synonymous with what both a producer and a director would do today. He was only answerable to studio head Horace Plimpton. As was the case with most of his films, it is assumed that Dawley wrote the scenario for the film himself. It is unknown whether Edison himself encouraged or approved the production at its start as he made only rare appearances at the Bronx studio. More than likely, the go ahead was given by the Studios managers, making sure that the script would conform to the decrees of the Trust’s Censor Board. The film opens with Frankenstein leaving to study at University, bidding goodbye to his sweetheart. Two years pass and Frankenstein has finished his contemplation of the mysteries of nature and seems ready to try his own hand at God’s work. However, his attempt at creating life goes awry, with a hulking, twisted creature emerging from the alchemical vat. Aghast at his creation, Frankenstein returns home to marry his fiancée and escape his mistake. But the creature follows him and confronts his creator, tormenting him. But, as the film’s final title character tell us, the creature “is overcome by love and disappears” into a mirror in Frankenstein’s study. Most films were shot in a day, but due to the special effects work involved Frankenstein’s production lasted nearly a week, stretching from some time between January 13, 1910 to January 19, 1910. (What little records survive are unclear. It is known the Dawley was out of the country filming in Cuba by January 19th. Some sources state that studio head Plimpton approved the film’s scenario on January 14th.) The film was completed and sent over to the Orange County, New Jersey offices for approval on January 28th and received that approval on February 1st. Over the next two weeks, musical accompaniment was picked and certain scenes were run through a stenciling machine to be tinted. Edison had pioneered the idea of tinting films to add color in 1884. Edison Studio’s Annabelle the Dancer, featuring music hall performer Annabelle Moore recreating her stage act “The Butterfly Dance,” was one of the first commercially projected motion pictures and was first exhibited at the Cotton States Exposition in Atlanta, Georgia in mid-September 1885. Since her act used a projection of colored stereopticon slides as she danced with long silk draperies, Edison touched on the idea to have prints of the film hand painted frame by frame, in the same manner that some photographs and portraits were tinted at the time. By 1910, tinting of films had become common, with blue often being used for night scenes, green for woodland scenes and so on. In the second half of February, the film was assembled with each scene was pasted together to form a complete print. In early March, Edison Studios copyrighted the picture and submitted paper prints of several scenes to the Library of Congress. In a cost cutting measure started right before the turn of the century, the studio had begun to have a positive print of each film developed on sheets of paper instead of actual film prints for submission for copyright. (The studio would later switch to paper rolls.) That a number of Edison films that have survived did so mainly through the existence of these paper prints. Currently, the Library of Congress only has selected scenes from Frankenstein, not a whole copy. However, Frankenstein did not generally do well with audiences. There are several possible reasons that may have contributed to its less than stellar reception. Frankenstein was the first horror movie and audiences possibly weren’t sure what to make of this weird story. Moving pictures were already becoming more sophisticated with the use of close-ups and editing within a scene becoming more common. It’s possible that audiences found director Dawley’s stage-y, wide shots to be old fashioned. It has also been reported that in some communities there was objections to the film due to its perceived blasphemous content. Debates were ongoing around the country over Darwinism and a film that could be seen as mocking the creative power of God was sure to draw fire from the pulpit. Regardless of the reasons, the film made its distribution rounds and was then withdrawn from circulation. 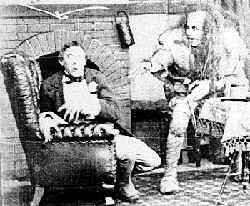 While some films like 1903’s The Great Train Robbery remained popular and in circulation for years, Frankenstein quickly faded from the public’s minds. At the time, Edison Studios would only strike approximately 40 prints of each of their productions, which would then be sent out for distribution. After the films had circulated for seven months or so, they were returned where they were stripped for their silver content. The films were quickly forgotten by the studio and the public and no thought was given to any future value they may hold. That even a handful of Edison Studios films still exist on celluloid is only due to the efforts of private collectors. However, the film would take a roundabout way to Dettlaff’s possession. After his wife’s grandmother left show business, she passed her film collection and projector to her son, who in turn passed them on to his son, Dettlaff’s brother-in-law. Not knowing what he had in the collection, Dettlaff’s brother-in-law sold the entire collection to a film collector, who then sold it to another collector of Dettlaff’s acquaintance, from whom Dettlaff purchased them in the mid 1950s. Since he was running silent films for his children as a way of teaching them to read, he did screen the film. However, noting that the film had some wear and tear, and about 8% shrinkage due to age, he placed the print aside, so as not to damage it further. When Dettlaff heard of the film’s placement on the AFI’s list, he announced that he had indeed had a copy. However, knowing the worth of such a treasure, Dettlaff has been reticent about releasing the film to be seen. In the late 1970s he had allowed a few minutes to be shown as part of a BBC documentary, later released to home video. These snippets would later wind up in various silent cinema video compilations without attribution or payment made to Dettlaff. Feeling slighted and perhaps not appreciated for his archival efforts, Dettlaff has been guarded in allowing the film to be screened. In 1986, he donated a “copyright protected” version of the film, with a copyright notice that scrolled across the center of the film making viewing difficult, to the Academy of Motion Pictures Arts and Sciences. He has also reportedly made numerous safety copies of the film on 16 and 35 mm. In 1975, at the urging of TV news photographer Charles Sciurba, Dettlaff undertook making a copy of the film with the aid of Clarence Stelloh, who had worked as an engineer at Western Electric duringthe early days of sound film. Working over several weekends, the pair used a 16mm camera and a modified step printer to copy some 14,000 to 15,000 images at a rate of one to two frames a second to create a 16mm backup copy of the film. Complicating the project was the fact that the film had shrunk by up to 8% at some spots, necessitating Stelloh to make changes to the printer to accommodate for the varying space between the sprocket holes. Detlaff held the first public screening of Frankenstein in decades on October 30, 1993 at the Avalon Theater in his hometown of Milwaukee. It was the first of several annual screenings at various venues in the city. In April 2003, Dettlaff screened the film at the Landmark Loew’s Jersey Theatre in Jersey City, New Jersey as part of a weekend long festival of Frankenstein films. Both evenings’ shows were packed with people curious to see the fifteen-minute short that has so captured the imaginations of film buffs through just one frame. The screening was also used to launch the film’s release on DVD, available from Dettlaff’s own A. D. Ventures, International. I had met Mr. Detlaff before he died. I have a DVD of his film. It is amoung one of my most prized DVD’s.